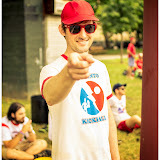 ﻿ Brooklyn Kickball: 13th Anniversary Free National Invitational Tournament! ¡Saturday, July 14th, 2018, Our 13th Annual! ¡Watch the Finals between Long Island and Brooklyn! Pro Pix, by Alvaro Saavedra! Photos from Tournaments' Past. Come make your own, All-Star! Keep the Trash Talking Alive! Join The Conversation & Kill Philly!